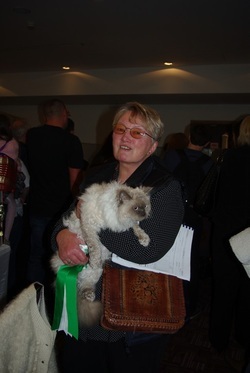 The wonderful Selkirk Rex, both longhaired, shorthaired, curly and straight coated are curious, tolerant, extremely sociable cats that enjoy spending time with their preferred persons. People-oriented without being clingy, Selkirks have a generous measure of love and loyalty for their human companions. Selkirks fit in well with other family members including children, and usually get along well with other companion animals. Because they are very social, they don’t do well in isolation or when left alone for long periods. Selkirks are fun-loving cats that stay playful and kittenish well into adulthood. They enjoy a good game of fetch and particularly enjoy games in which their guardians take active roles. Laser lights, feather toys, catnip mice and even a wad of paper can keep them entertained for hours. Silky at the Cork Show on September 23rd 2012 where she won 1st Open BOB and had a red card day - not a bad start. Blathin - AKA Delicious Flower from Like A Lamb cattery in Lithuania. She is an odd eyed white Selkirk Rex. Curly like a lamb.!! Blathin arrived in Dublin on Monday, Sept 10th, after a long journey - she is so very welcome. Our lovely new baby - Skyota Sioda Dathuil - AKA Silky. Welcome little girl. 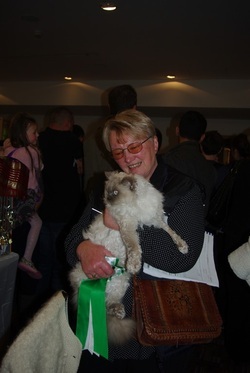 TICA Gr Ch & Ch Curly Quiara van Brifety at the TICA Dublin show 01/04/2012. Well done curly lady.